Robert Watts had left the execution of the performance to Ann Noël, who asked the art critic Henry Martin to help her perform the piece. The event took place in the amphitheatre in the middle of the park. 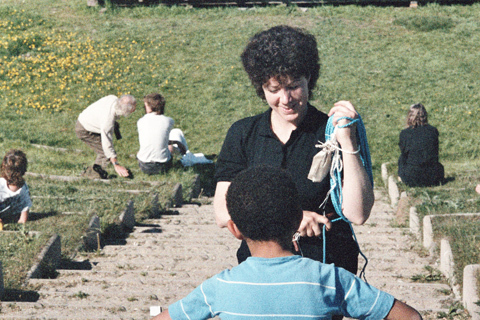 With the choir standing on the platform at the centre of the amphitheatre, Ann Noël walked down from the highest side of the amphitheatre, unravelling a coil of rope. Henry Martin was holding on to the opposite end of the rope. When Ann Noël reached the conductor onstage, she raised the rope above her head, and Henry released a bundle of sausages attached to a pulley. The sausages came rolling down the rope to the choir who enthusiastically consumed the lot of them. Bob Watts was back from Copenhagen this morning, but left all the arrangements for the performance of his piece to me. It took me the great part of the morning and most of the afternoon getting it together and finding someone else to help me. Bent Petersen had offered, but like Bob he was too busy taking photographs and in the end it was Henry Martin who held the other end of the line. The event took place in a small amphitheatre in the middle of the park. It was hot and sunny the way it has been all week and perhaps that is why there was a comparatively small audience to hear the choir perform pieces by Phil Corner, Eric Andersen and to my mind they were not very successful either. At a pre-arranged moment, as the choir stood on the platform in the center, I was walking down from the highest side of the amphitheater unraveling a coil of rope as I went until I stood next to the conductor onstage. Then Raising the rope over my head, Henry released the bundle of sausages tied to a pulley and they came rolling down to the choir who then proceeded to eat them. Short and sweet. Eric told me later that we had performed the piece beautifully. It was all the more effective as it was simply programmed as part of a concert of “music music” pieces in a concert hall. I was the conductor and the pulley came right to me; there was a sausage, a big fat one, and a loaf of typical New York “Jewish” rye bread. I believe (but am not sure) that the knife and jar of mustard were already on the podium (they certainly did not come down on the pulley). The players had to wait impatiently while i sliced both bread and sausage and lathered on the mustard to make sandwiches, which i carried over to each one. My chorale piece in Roskilde was originally called “Boston Waterfront”, where it was first done, in a workshop. For this i called it “Boston in Roskilde”—-actualli i’m note sure about this. Anyway, it was a way of generating a dissonant chord without the difficulty of trained musicians doing a complicated ear-training number. The chorus starts out all around, and each one’s note was thought out ahead of time, privately. They hum it. Noone can hear the whole chord at one time, so the singers circulate through the public, forming temporary groups. This simple but effective piece has been done quite a few times, and i particularly remember a session at the university in Kupang, West Timor, Indonesia. There is also an even livlier version, for participants only, where everyone keeps humming while they roll over each other on the floor.